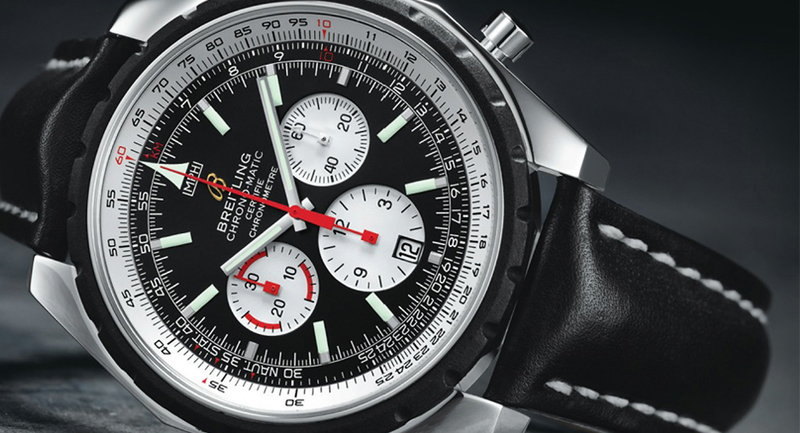 The Breitling Professional Emergency Dial Watch. If you’re an aviator plagued with worry about what might happen in the event of a crisis, purchasing a Breitling Emergency Dial Watch (E7632110/B576) might ease your mind. Breitling has a long history of dedication to precision chronometers, and were the first to submit their models to the rigorous Swiss Official Chronometer Testing Institute (or COSC) in 1999. The Breitling Emergency not only continues this history, but takes an extra step toward professional safety by providing a built-in micro-transmitter whose broadcasts can be received by emergency rescue aircraft. With an approximate retail value of $6200, the Emergency might be worth an anxious pilot’s consideration. The Breitling Emergency Dial Watch helped to save British pilots Steve Brooks and Hugh Quentin-Smith when their helicopter went down in Antarctica, and it has helped many others. Here’s how it works: in the event of an emergency, the user twists of the large cap at the bottom right of the case and pulls out the wound antenna within. This releases a signal at 121.5 MHz–the frequency used to finding victims with search-and-rescue homing devices. This signal alone will operate for up to 48 hours, and can be picked up within 100 miles of the watch, provided that the ocean or land is flat and that searching aircrafts are flying at about 20,000 ft. When used to complement the aircraft’s own distress signaling equipment, it can increase the pilot’s chance of being found. Once the emergency feature is used, the watch may be sent back to the factory to replace it at no cost—provided that there actually was an emergency. The Brietling Emergency is made with titanium (though the wristbands also may come in leather), making this 44mm diameter, 15.7 mm thick dial watch a light but durable 86.6 grams. 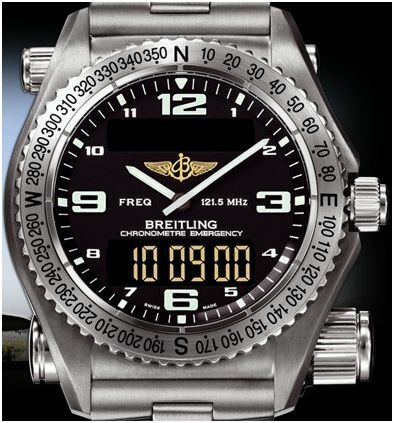 Its glass is made of sapphire and glare-proofed, its bezel a compass scale with 10-degree increments. It features thermo-compensated quartz electronic, analog, and 12/24 hour LCD digital display, as well as an EOL (end of battery life indicator) and a digital calendar with the day and date programmed for four years. Customers can choose between the original black or a yellow, orange, or blue background. A couple of options for the look of the Breitling Emergency. At about $6,200, is the Breitling Emergency worth your money? That’s difficult to say. It would almost certainly not behoove those with a pedestrian life to put down the money for this watch, as non-pilots must sign an agreement saying that they will cover the full costs of a rescue if they trigger a false beacon. Celebrities Bear of the show Man vs. Wild and Brad Pitt have sported Emergencies, but their need for it (especially in the case of Brad Pitt) is dubious. If you’re a normal person that just wants a good watch, you might try checking out Breitling models outside of their Professional collection. Even for pilots, the Breitling Emergency has a couple of caveats that could compromise its value. With no backlight and minimal luminosity on its hands and numbers, the face might be a bit difficult to read in the dark. The watch only has a 3 bar water resistance, which means that it’s suitable for everyday use but damaged if a pilot were to crash in the ocean. Stormy seas or rugged terrain will compromise the emergency beacon’s ability to be discovered, though the likelihood of a crisis in these environments equals (if not surpasses) that of calm sea or flat land. The 121.5 MHz beacon is too feeble to be detected by satellite, so it relies solely on rescue aircraft. Still, the Breitling Professional Emergency E7632110/B576 dial watch could do a pilot a lot of good, both in the event of a crisis and as a precise chronometer. It has helped others, and if you’re an aviator with a love for quality and safety, the Breitling Emergency will feel wonderful on your wrist. Chronograph: 1/100th second, max. 23hrs59min. 59.99sec.